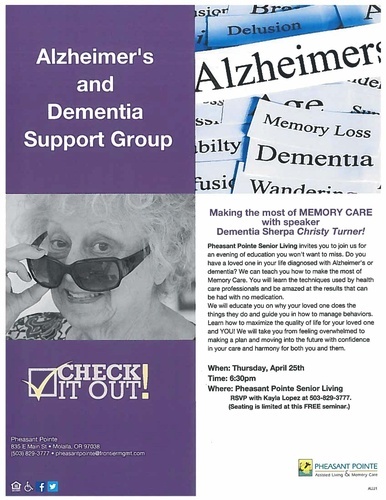 Pheasant Pointe Senior Living invites you to join them for an evening of education you won't want to miss. Do you have a loved one in your life diagosed with Alzheimer's or Dementia? They can teach you how to make the most of Memory Care. You will learn the techniques used by health care professionals and be amazed at the results that can be had with no medication. They will educate you on why your loved one does the things they do and guide you in how to manage behaviors. Learn how to maximize the quality of life for your loved one and you. They will take you from feeling overwhelmed to making a plan and moving into the future with confidence in your care and harmony fo both you and them. Seating is limited at this FREE seminar.